On January 9th, Nature Communications magazine published the result of research conducted at the Laboratory run by Prof. Carmo Fonseca. While forming an unbeatable duo with researcher Bruno de Jesus, the country jumps in the hope of being able to cause time to stand still so we could stop ageing. It could be merely a question of aesthetics, but it’s not. Illnesses such as Alzheimer’s may one day be stopped. While the press pounded the news, hearing those involved was a must. Carmo Fonseca: First off, let me just say that the role of our University cannot be limited to giving classes to Medical students; it must also be a cultural place for research. To such end, we need to have researchers and to provide them with the proper conditions in terms of both infrastructures and the freedom to follow their own ideas. And this is an excellent example because Bruno is a researcher who did his post-doctoral training in Spain, at a laboratory that was highly focused on ageing processes. Then, when he joined my group, we attempted to find scientific common ground. My laboratory and my whole life have been dedicated to RNA, a molecule called ribonucleic acid, a transmitter of information between genes and proteins. One of my main scientific goals is to understand the mechanisms in which RNA is involved and how we can manipulate these processes. And this is the context that gave rise to the discovery; however, over the course of its process that took several years, master’s and medical students became involved in the work. This clearly shows the advantage of us at the Faculty of Medicine having an Institution such as the Institute of Molecular Medicine, which promotes a melting pot that facilitates discovery for a large number of people. Of course, medical students should be allured and they are present; one of the co-authors of the publication that has now gone public is Catarina Vale, a former Medical student who is now in Vila Franca doing her internship. We also rely on two master’s students from other universities and on the participation of Sérgio, a technician at the University who provided support to Medical students in practical laboratory classes, but who is also involved in our research work. Thus, we highlight how the Faculty of Medicine is playing its role and carrying out its mission. Bruno de Jesus: I had completed my post-doctoral degree in Madrid and I felt it was time to return (to Portugal). I was away from the country for ten years and I had a feeling that it was the right time for me to return. Professor Carmo already had an ongoing collaboration with the heads of the laboratory in Madrid – Maria Blasco and Manuel Serrano – and that eventually helped me choose the laboratory in Portugal. It’s also true that I wanted to come to a dynamic Institute, and the iMM ranks among the most dynamic Institutes in Portugal. The approach consisted in my seeking out Carmo Fonseca. Carmo Fonseca: I’m not the one who extends invitations; people choose me. My role here is to be a mentor; generally, young people are the ones who choose their mentors. Bruno de Jesus: The synergies of interests may require adjustments. 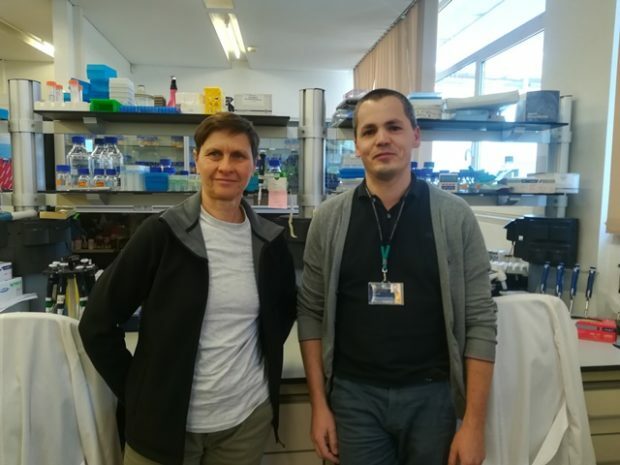 Carmo’s interests are more focused on the biology of RNA, that is, the purest and hardest science, whereas mine are more along the lines of observing the organism. That is, we looked at mice and understood how ageing processes occurred. Following a bibliographical analysis, we began to look at specific RNAs and how such RNAs behaved in a simpler ageing model that could be done here; instead of looking at an entire organism, we looked at the cells. However, cells end up serving as a good ageing model; that is, we age because our cells age and our tissues age. Thus, this is where we began, attempting to understand the difference between an old mouse cell and an embryonic cell, that is, a very young cell. The same type of cells, fibroblasts are skin cells that are found both in very young mice and in very old ones. What is it that separates the two of them? With special RNAs, and this is where Carmo came in. These “special” RNAs are unique, because they almost do not lead to the formation of protein, as they work solely by the sequence, by the RNA per se. And so this is where we discovered that some RNAs showed different behaviours between the two models, between very old cells and embryonic cells, and we looked at a specific one, and that’s where we started off. That is, if we were to change the levels of this RNA in very old cells, this RNA would be more expressive in old cells than in young ones. If we were to lower RNA levels in cells, would their behaviour get closer to that of younger cells? That was our question. There are various techniques for finding out what distinguishes a young cell from an old one. We focused on cellular reprogramming, a discovery made in 2006 where it was found that an adult cell could be turned into an induced pluripotent cell, similar to stem cells. It was possible to reverse an adult cell back to an embryonic cell with pluripotent features, that is, with the ability to lead to the formation of other tissues. While this process works very well in young cells, ageing is a hindrance to this conversion. We then studied this specific RNA and whether, by reducing the levels of this RNA, we could lead very old cells to turn into stem cells. That was the protocol that we tested and which worked. Basically, when we lowered the levels of this RNA, we were able to turn very old cells into induced pluripotent cells. These cells are similar to stem cells and may be used for differentiating in every adult tissue. Having asked that question, how many years did it take you to come up with an answer? Carmo Fonseca: The project itself lasted 4 years, because it was based on a good model. This was one of those “eureka” experiments, because Bruno looked, analysed and said, “look, maybe this is a good target to go for.” And when he conducted the experiment, that worked on the first go. When we get to the notion of “eureka,” there’s an explosion of joy, right? Carmo Fonseca: Following the discovery and the first explosion of joy, there comes repetition and more repetition. Afterwards, we need to convince and prove to others that we’re right. It was so incredible that different people conducted the same experiment to prove it was correct. Now, the big test for us is for other researchers from other laboratories to take this, use it and repeat it. Doesn’t this take away your leading role, or your patent on the discovery? Carmo Fonseca: No, no, it solidifies it further. A discovery that is not used by others is always a dead end and it is always different when other researchers think of other uses. Since they have different ideas, they will use this from different angles we didn’t think of. Where are we heading now? How will this discovery be reflected? Carmo Fonseca: The idea is to attempt this on humans. That’s what everyone wants to know, whether it works on humans, at various levels, because, since we were able to revert these skin cell features, people say a cream will be created that will revert old skin. Perhaps, we don’t know! Now we need to run tests geared toward those applications. Carmo Fonseca: Perhaps aesthetics is one of the easiest applications because, for example, to help Alzheimer’s patients, we need to make new neurons and implant them in the brain. This is possible: experiments are already being conducted in that regard, using animal models. This is how Medicine is evolving, in the sphere of Regenerative Medicine, as its basic principle comprises taking the body’s old parts and replacing them with new ones. Therefore, if we have an illness where neurons are degenerating, we will put in new neurons to replace those that are sick or dying. There are huge advances in this field, with the brain being one target, and the heart being the other. In myocardial infarction patients, it’s about trying to put in a new wall in the heart. That is, we always talk about situations where we can reverse cell death. Neurodegenerative diseases always appear quite frequently. However, we can think about diabetes and replacing the pancreas. We can think about diseases of the joints, the bones, anything pertaining to malfunctions of the body’s normal cells can potentially benefit from this type of Regenerative Medicine. What’s next for you as a team, and in this specific research? Carmo Fonseca: Exactly. This is the history of Science. Bruno came to my research facility because he still wanted some sort of mentorship; that is, he wanted to have a mentor. But now, it’s time for him to fly on his own, and he’s going to take this discovery with him. Thus, we are now at a cut-off point, we have reached a crossroads. Bruno is currently looking for his independent position. Is this process normal? Is it a good sign when someone leaves? Carmo Fonseca: That’s exactly it. And I’m very happy for his journey. I’m happy for having served as a good mentor because Bruno leaves with a very interesting story. Bruno de Jesus: Me, too. Still, there are always projects where we continue to work together. It’s our main interests that are now following different paths. The RNA’s etymology ends up staying right here; that is, it’s the most mechanistic part, how it works, even at cell level. And then, there’s that more general part of hindrances, the ageing; that is something that needs to be looked at more from outside the cell. We need to look at the cell and see whether it’s the same, larger, or smaller, and that’s where our paths are going to change. I’m continuing more along the general features of the ageing process, but outside the RNA mechanism. Carmo Fonseca: Whereas I’m greatly interested in the possibility of manipulating RNA, as we are still looking for other RNAs of this type. This is because, from a scientific standpoint, this discovery goes beyond the discovery of how to reverse ageing. The way we achieved reversion involves touching molecules that are not sequenced, and I’m very interested in delving into this component. These new molecules do not comprise a usual RNA molecule; while it’s a rare type of RNA, it’s not unique. We’re looking to see the “cousins,” or the “siblings” and see what they’re up to. This is the side that I, as an RNA scientist, will keep on looking into. And I think that Bruno will be more interested in the effects of reversing the old phenotype. Does a discovery actually take shape only after official scientific publication? Carmo Fonseca: It only truly takes shape if it is used by others. At the moment, we have disclosed our discovery to the world, and now it may become one of those oddities that nobody else looks into, just us. Or, if indeed others find enough newness in the discovery and use it, they can then take the discovery much further and achieve outcomes that we cannot predict. Other heads will come up with ideas on this matter. This is the process of Science, where every researcher climbs one level and then the other researchers, below that level, take the next step. So, no laboratory actually holds and owns an idea? Are discoveries team projects that are passed from hand to hand? Carmo Fonseca: Science is very much that. Bruno de Jesus: The publication is not a patent; it’s about disseminating our information to the public. You can delve deep and then move on to other points of discovery, or take the same techniques and repeat methods. Publication does not protect results. Bruno de Jesus: There was a lot of pressure. Carmo Fonseca: But since it was a highly unexpected result, we were asked for even more repetitions. From 2016 until now we’ve been conducting more experiments that our peers, or other researchers, asked for in order to be convinced that this was true. And only after having passed this sieve did the publication emerge. Bruno de Jesus: It didn’t go badly at all, in the end. Bruno de Jesus: It’s normal for them to want confirmation as there are publications that are launched with errors, and they are now asking for assurances that what is being published is correct. Carmo Fonseca: Sometimes there are observations that occur which fail when another person at another laboratory attempts to repeat them. The scientific community wants to protect itself from this kind of fake news.